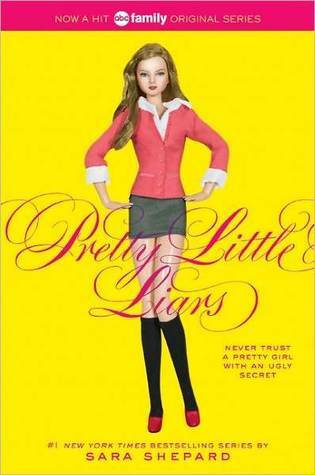 Everyone has something to hide-especially high school juniors Spencer, Aria, Emily and Hanna. Spencer covets her sister's boyfriend. Aria's fantasizing about her English teacher. Emily's crushing on the new girl at school. Hanna uses some ugly tricks to stay beautiful. But they've all kept an even bigger secret since their friend Alison vanished. How do I know? Because I know everything about the bad girls they were, the naughty girls they are, and the dirty secrets they've kept. And guess what? I'm telling. I so wanted to like this! I did, I really did. I picked this up because of the TV series - I'm not ashamed to admit that. My younger sister raved about the show and because of the person that I am, I had to read the books before I started Hollywood's adaptation. Mentally, if I know there's a book of a show/movie, I have to read the book first. I have to know the true back stories or else I feel left out in the cold. It's a sickness, but I'll admit to it. No shame. Anway, the book was blah. Nothing was shocking and nothing was surprising. I was able to read it in a car ride to Niagara Falls (about 4 hours) - but only because it was an easy read, not because I couldn't stop, and I was stuck in the car. Back in the eighth grade, Alison, one of the most popular girls in school and "leader" of the group of friends mysteriously disappears. Now, in their junior year of high school, the girls have drifted apart. Only "The Jenna Thing" keeps them relatively connected. They have their own secrets now: Aria has a crush on her English teacher, Spencer falls for her sister's boyfriend, Emily falls for another girl, Hannah struggles to stay thin. However, the girls are thrown together when a mysterious "A" starts sending each girl messages about something from their pasts - things only Alison knew. I liked Emily. She tells Alison she loves her - yes, love loves her - and Alison continues to hold this over Emily's head like it's something she be ashamed of. After meeting Maya, her new neighbor, Emily realizes she has feelings for this girl and maybe she doesn't want to be on the swimming team and date her boyfriend anymore. Her parents are conservative are not thrilled. I really liked Aria, too. It was interesting to see her coming back to the US after being in Iceland for so long. She blossomed in Iceland and is now struggling to fit back at her old school - doesn't help that her past best friends aren't really friends anymore. And then she falls in love with her English teacher! Oops. Of all the stories, hers was probably my favorite. As for Spencer and Hannah, I'm pretty sure I've read their stories before. Spencer falls for her older sister's boyfriend. Shocking! The little sister has a crush on her sister's boyfriend. Not a huge secret. Same deal for Hanna. The past "chubby" girl is now gorgeous, popular, kicked a bulimia habit, and steals. Blah, blah, blah. After reading the book, I checked out the first episode of the show on Netflix. Just FYI, the first books IS the first episode. That's how little plot this book contains. I thought about reading the next few books, that maybe the series will pick up, but this just didn't hold my interest enough. If I'm really interested in continuing this saga, I'll most like just tune in to ABC Family.